Built: 10th and 11th century. Notes: Castello di Nerola or castello Orsini di Nerola is located in Via Aldo Bigelli in Nerola, in the province of Rome. Lack reliable data on the dating of the castle but hypotheses lead back between the 10th and 11th centuries in the same time when some countries began to take refuge in summits and building castles. Even the early centuries of the castle life are dark, but sources they want possession of the Orsini (hence the name) in 1235. This reinforced the family castle elevating the corner towers and circumscribing the castle with a wall. Marie Anne de La Tremoille Princess of Nerola, as the wife of Flavio Orsini last Duke of Bracciano and Prince of Nerola, created an essence of bitter oranges to bring to Paris, to which in honor of the country he named Neroli, still used today fragrance in France. 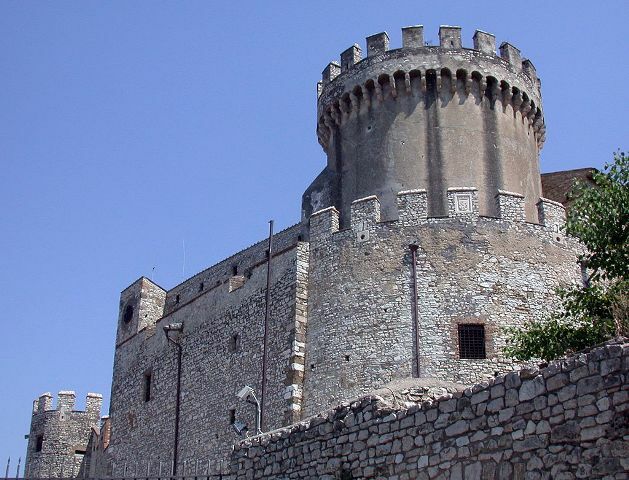 After the death of Flavio Orsini and Annamaria, the castle passed, including their other fiefs, to the descendants Lante Montefeltro della Rovere. From these they passed to Barberini, then, in 1728 to Sciarra Colonna by marriage (in fact Julius Caesar married Cornelia Barberini Colonna. In 1867, the partisans took refuge in the castle sheltered by the papal troops. Later it was the Ferrari Frey Marchesi. In the twentieth century the castle was bought by the company CA.DI., restored and used for cultural and leisure activities.